We’ve all been there. Your in a store and the blush looks amazing, but when you get home you find the color isn’t right for you at all. None of us want to look like a clown and we all want cheeks that look natural. Well, now you can have a flush that is all your own! 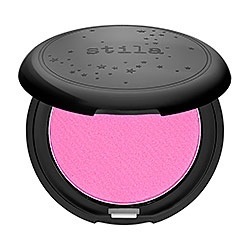 Stila’s Custom Color Blush is the first-ever PH based powder blush. You know all the lip products that adjust to your own body chemistry and give you the perfect shade for you? Now you can have that for your cheeks. This blush is a “one shade fits all” and reacts to your skintone and individual PH to create a perfect, personalized shade. It is very blend-able, has a velvety-soft finish, and smoothes the appearance of fine lines. Your cheeks will have a natural glow with a luminous, flawless flush. It’s ideal for summer because it is so easy to apply-no mistakes with this wonder. 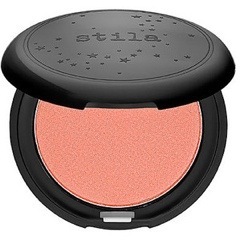 Stila Custom Color Blush come in two shades. Don’t be alarmed by the brightness, they are actually quite sheer and you can build the color. I prefer the coral-very sunny! Love your blog! I will definitely try this blush!